It’s hard for me to believe, but numbers don’t lie. This is my 200th post. I’m not sure how I got here this quickly but I’m happy to say I’m here, and that this blog has brought me a lot of joy. I thought long and hard about what to write here for this milestone. For my 100th post, I listed 100 foods I like to eat. For my 200th, I considered listing 200 vegetarian main courses I have eaten in the interest of continuing to show how exciting and delicious a plant-based diet can be. Instead, I am going to attempt to first stop the doubters and then spread some love. There are those who think that feeding a child a vegetarian diet is depriving them somehow. That they can’t possibly be healthy. That they won’t get all the calories and fat they need. That children need meat to thrive. For the people who think so, I give you my 35 pound, incredibly healthy, delightful, squishy, and vegetarian 2 year old. I am going away for a little over a week. My little family and I are boarding a plane early tomorrow morning and heading East to the Maryland shore. While I am gone, I’d like to suggest you check out some blogs that I am just loving these days. I read a lot food blogs. Every one I subscribe to I like, but there are some I love. Oh, I love the obvious ones – Smitten Kitchen, Orangette, 101 Cookbooks. But I thought I’d spread some love to some people that you maybe don’t know about. I love eat make read for her whimsical touches on the photographs and I love that it’s not always about food. I love A Chow Life for her simple prose and knock-out food. I love fresh365 for the truly gorgeous photography and clean healthy food and I love how simple and beautiful her website is. I love Stacey Snacks for her great sense of humor and her hearty, generous food. I love Let Her Eat Cake for the diversity of her recipes and for making everything look delicious. I love Eat Me, Delicious for her shared vegetarian sensibilities. I love Everybody Likes Sandwiches for her Northwestern charm and her awesome whimsical style. And I love Lisa is Cooking because she is a damn fine cook, one of the best out there in my opinion, but she doesn’t brag about it. So, enjoy while I am away. But y’all come back now, y’hear? For most parts of the country, soup in the summer may sound awful. Unless it something cold like Gazpacho or Chilled Avocado Soup. Here in Seattle, soup in the summer can be very welcome. The June that you all have had on the East coast? That’s what ours is usually like. Long days, but long wet and gray days are not the kind of long days you long for. Welcome to our Northwest world. This year, we have had your kind of June and man! is it awesome! Still, we don’t get the stifling heat that makes you think soup would be a bad thing. Even on a warm day, the evening cools down enough to put on a sweater while eating dinner in the backyard. I love that about Seattle. People wonder how we can live in this climate and I wonder how people can live in a climate where you can’t go outside because it’s too hot. To each his or her own. If you are so inclined, this is a nice soup to make in warmer weather because it doesn’t have to be served hot. It is just as lovely when served slightly warm. Yes, you have to turn on your oven for a bit to make the ricotta dumplings, but you can do it in morning and let them rest until you are ready to serve dinner. 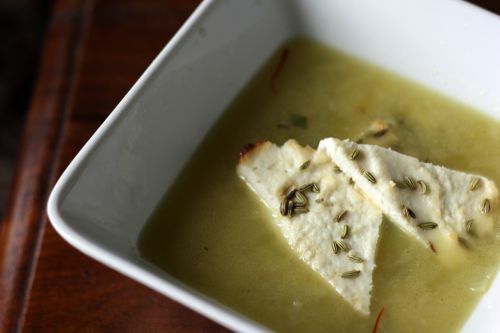 Because of the cheese triangles and the almonds in the soup, you really only need a nice salad to round out this meal. I made this for my clients last night so I also included a Pissladière which I think went really well with the soup. One of the many nice things about this soup is that there is virtually no waste. All the trimmings of the vegetables are used in the (very quick and simple) stock. 2. Put the vegetable trimmings in a pot with 7 cups water, the bay leaf, the parsley, and 1/2 tsp. salt. Bring to a boil, reduce the heat, and simmer, covered, for about 25 minutes. 3. Press the ricotta into a 6-cup dish brushed with olive oil and sprinkle the fennel seeds over the top. (DT: I used a Pyrex 8×8 inch pan.) Bake until golden and firm, about 45 minutes. Cut into triangles and set aside. You can make the soup while it’s baking. 4. Slice the fennel into pieces that will fit in a soupspoon. Melt the butter in a soup pot and add the vegetables and parsley. Season with a teaspoon of salt, toss them around to coat, and cook over medium heat for about 5 minutes. Add the almonds and saffron and cook for several minutes. Strain the stock. You should have about 6 cups, or a little less. Add the hot stock to the soup vegetables, bring it to a boil, then lower the heat and simmer for 20 minutes, or until the vegetables are soft but not mushy. Add the peas during the last 3 or 4 minutes. Taste for salt and season with pepper. 5. Serve the soup in soup plates or small bowls. 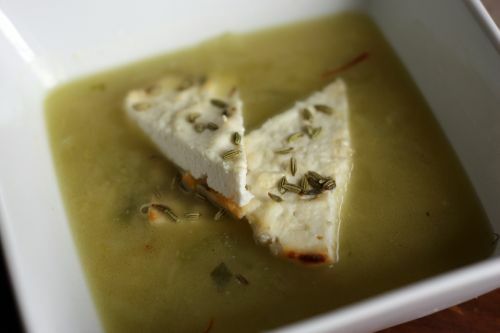 Add 3 pieces of the baked ricotta to each bowl, sprinkle with the minced fennel greens, and serve. In addition to the cake that I brought for my friend Lauren’s 40th birthday, I also brought a couple of appetizers. I figured since her husband Travis was going to be hauling the entire dinner up the mountain, the least I could do was bring some things to munch on while he got the rest of the food ready. 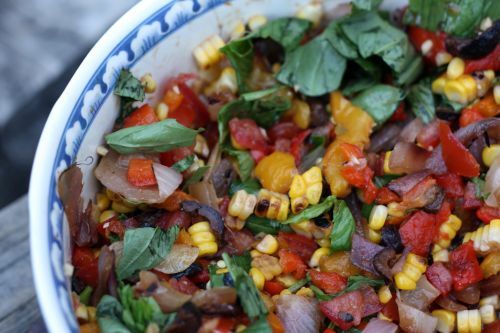 When I was searching for recipes for another friend’s 40th birthday party, I found this one for Grilled Vegetable Salsa. I was planning to make it for John, but then decided to take the party in a more Mediterranean and less Mexican direction. The idea of the salsa stayed with me and when I learned fajitas were on last weekend’s menu, I knew exactly what to make as an appetizer. This recipe comes from Martha Stewart’s Hors d’Oeuvres Handbook. I love this book on principle. It has lots of gorgeous photographs in the front and all the recipes in the back. It is well laid out and all the recipes I have tried are winners. What I don’t like is that almost every recipe suggests you serve the dish right away. What kind of cocktail party is there where you can make everything à la minute? So, I take a lot of what is said in the book with a grain of salt. Against Martha’s advice, I also streamlined the cooking process and I made parts of the salsa ahead of time. It was great and everyone loved it. The salsa was awesome with chips, but you could incorporate it into a main course by spooning a generous amount of the salsa over black beans and rice, and topping it all off with slices of avocado or guacomole. Stewart calls for three different cooking methods for the vegetables. I streamlined it into two. You could further streamline it by just grilling the peppers rather than roasting them. If you do roast the peppers, they can be made up to four days ahead of time and stored, covered, in the refrigerator. 2. 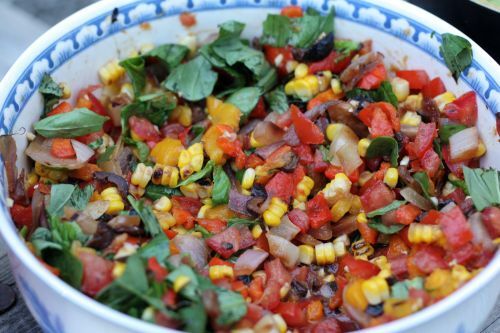 In a large bowl, combine the tomatoes, peppers, corn, and onion. Stir in olives, garlic, cumin, and lime juice. Season with salt and pepper. Allow the vegetables to marinate for at least one hour and up to six hours. Just before serving, stir in the basil and season to taste. Last June, as my friend Lauren was turning 39, we started brainstorming about what to do for her 40th. I seem to remember talks of Sonoma or Napa, or maybe just a weekend at a spa somewhere. Several months later, she called me to tell me she had changed mind. If she were to plan, say, a girls camping trip instead of a spa for her birthday, would I go? Let me say here that I am not especially prissy. I spent my childhood summers going to a camp where we slept in tee pees and if you wanted a hot shower, you had to build a fire to heat the water. I have climbed a 10,777 foot mountain and I have biked 1800 miles across France, camping all the while. My feeling is – I have done all that stuff and I enjoyed it then. Now that all that is behind me, I like nice restaurants and hotels and a pedicure now and then. So, it was a testament to how much I adore Lauren that I said of course I would love to go on a girls camping trip. The girls camping trip morphed into a couples trip into the mountains a few hours outside Seattle where there is an alpine resort of sorts. Eight couples were slated to enjoy an afternoon of hiking and then a fajita feast prepared by Lauren’s husband Travis. Perhaps some songs by the campfire and s’mores would round out her celebration. Travis is a great cook but he doesn’t really like to bake. So I offered to make the birthday girl a birthday cake. She asked for chocolate and I found something that sounded like a home run. 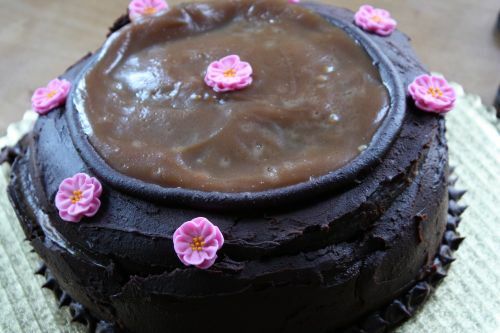 Chocolate Cake with Fleur de Sel Caramel Filling. Mmmmmm. Last week was a rough one for me. In addition to many other problems in the kitchen, I had trouble frosting the cake because the filling (bittersweet chocolate ganache and salted caramel) was oozing out the sides. I kept wiping it up with my fingers until I had the brilliant idea to freeze the cake before frosting it. The good news is that the fingersful of filling (say that 10 times fast) that I tasted were delicious. So even though the cake would probably turn out crooked, as all my layer cakes do, I knew it would taste good. The freezing worked. I was able to frost the cake without the layers sliding around and no more oozing. What I didn’t take into account was riding up to the “resort” on the dirt road was kind of like being on a bucking bronco. It took us 30 minutes to go 7 miles, bumping all the way. The cake was wedged in well but it couldn’t survive a journey like that one. I tentatively opened the box only to find that the entire top layer had slid off the rest of the cake. I was able to put it back, but the beauty of the cake was definitely compromised. Here is the good thing. After the stressful week, where I felt like I couldn’t do anything right, I was very zen about the sliding cake. I was out of my environment, away from my kids, and there was really nothing I could do except do my best to fix it, realize that everyone would most likely be fairly drunk by the time we actually ate the cake, and take comfort in the fact that I knew it would taste good. I just let it all go. As it happened, we were all fairly drunk by cake time and it did taste really good. I mean, really good. I think this is a really good recipe to have because much of it can be done ahead of time. You can start this cake 5 days before it needs to be served. 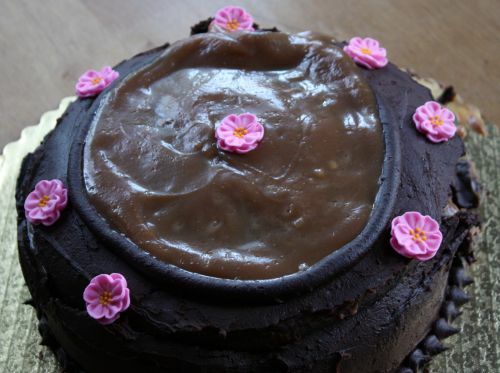 The caramel filling and the ganache can be made 3 days ahead and the whole cake can be made 2 days ahead. When all is said and done, the cake is fairly easy and the wow factor is huge. This cake is supposed to be baked in 2 9-inch pans. Those cakes are supposed to be split horizontally and filled, giving you a 4 layer cake. Because I couldn’t find one of my 9-inch cake pans, I put the batter in 3 8-inch pans instead. The cakes were too thin for me to split, so I just filled them as is. This left me with a bunch of leftover caramel, which is why I piped a circle on top and put the caramel there. If you were to follow the recipe and not lose one of your 9-inch cake pans, the top of your cake would be smooth ganache. If you were to simply put your in the refrigerator and then serve it (without the rodeo-like car ride that I experienced), the back part of your cake will most likely be round instead of smooshed as in the above photo. The original recipe called for a light sprinkling of chopped almonds in between each layer and on the outside of the cake. Because neither Lauren or I like nuts in our desserts, I opted to leave them out. If you wish to include them, you will need 1 1/4 cups chopped almonds total. Each layer gets sprinkled with 1 tablespoon, the rest goes onto the sides of the frosted cake. Cake: Position rack in center of oven and preheat to 350°F. Butter two 9-inch diameter cake pans with 2-inch high sides. Line bottom of each with parchment paper; butter paper and dust pan with flour. Bake cakes until tester inserted into center comes out clean, about 32 minutes. Cool cakes in pans on racks 10 minutes. Cut around cakes; turn out onto racks. Peel off parchment and cool completely. There is not a hex on my kitchen. I’m not sure I believe in hexes. If I did, I would tell you that without a doubt there is some hexing going on. It all started last Sunday when I mistakenly brought a feta cheese and Greek yogurt mixture instead of whipped cream over to a friend’s house. Strawberry shortcake needs whipped cream, people. Things have gone downhill from there. I have misplaced valuable pieces of kitchen equipment, broken things, had simple things not turn out. It’s been a week. Sunday – Baked strawberry shortcake and made strawberry ice cream for dinner with friends. Monday – Made a green salad, chocolate swirl pound cakes, and tiramisu ice cream for dinner with the neighbors. Tuesday – Made spinach and shallot flan, spring vegetable salad, and feta/yogurt spread for clients. Wednesday – Made an Indian dinner feast for a friend’s 40th birthday dinner. Thursday – Made salted caramel filling and chocolate ganache. Friday – Grilled vegetables for a salsa, made black beans for dip, filled and frosted cake for same friend’s 40th b-day party, made custard for ice cream for Father’s Day at my brothers’ house. Saturday – Away for the night for friend’s party. Husband goes off to Cannes (yes, Cannes, as in France) for a week. Sunday – Will come home around 2pm and frantically make raspberry cake and strawberry ice cream for Father’s Day. In the midst of all this, I am also a stay at home mom which means I am changing diapers, feeding and clothing my children and making sure they don’t do things like jump off the kitchen counter or destroy our entire DVD system (was not successful with the latter). This is a lot – even for me who usually does a lot. I think it’s too much. Oh, and did I mention that my insomnia is back? I’m averaging about 5 hours of sleep a night. Maybe this is why I am misplacing things and things aren’t turning out. When I realized today that I had misplaced one of my 9″ cake pans (where exactly would I have put that?) I was at my wits end. I improvised and made the cake in 3 – 8″ pans. When I started to frost the cake and the filling started oozing out the sides, I almost cried. I don’t have time for something to not turn out at this point. All this is the long way of saying that I’m not sure when the next recipe is going to appear here. I’d like to think that I will remember my camera tomorrow and will be able to tell you that the cake, salsa, and bean dip are amazing and give you the recipes complete with gorgeous photos. Actually, at this point, I will be happy if I remember all the pieces of things that I need to bring including a sleeping bag and a flashlight. I would like to think that my brain will start working again and the hex will lift. I would like to think I will be back in the saddle Monday or so. If not, you will know why. 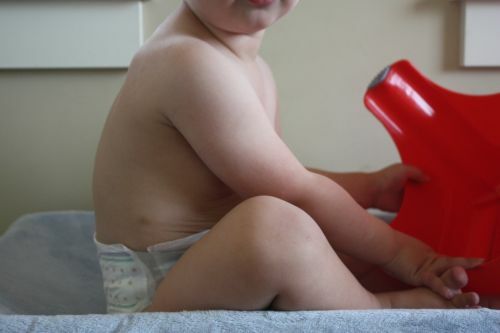 In the meantime, for the moms out there who work and/or multi-task like crazy…any tips?